Want to boost your batteries’ capacity without lifting a finger? Read on for our top tips on solar panels for camping. If there’s one thing we’re not short of in Australia, it’s sunlight. Sure, in the depths of a southern winter, it’s hard to recall the feel of sunlight on your bare skin but, in reality, we enjoy far more than our fair share of sunny days across the year. So taking advantage of this abundant resource to top up your RV’s batteries when you’re camped up off-grid is the smart thing to do. Solar power is energy that is converted from sunlight into usable electricity. And, best of all, it’s renewable, clean and free (after initial setup costs). 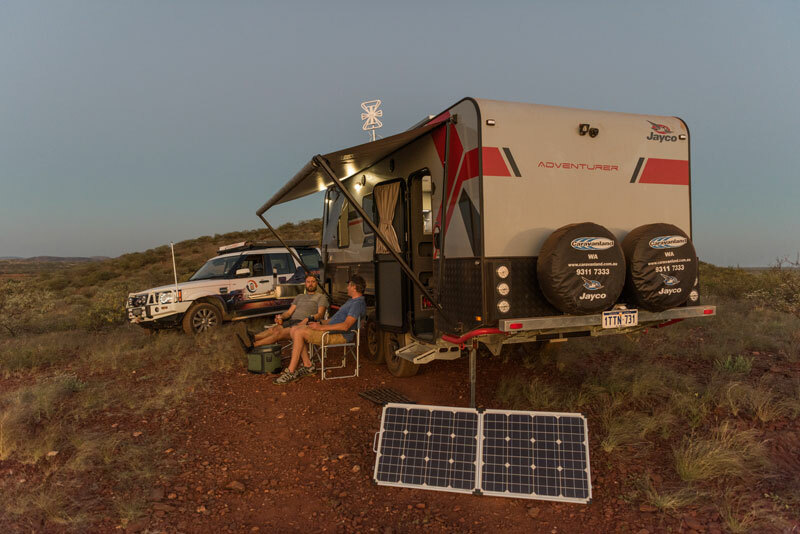 Solar panels can be mounted permanently on the roof of an RV or vehicle, or portable panels placed on the ground and moved around, to capture the sun’s rays and recharge your batteries and help run your 12V accessories. But there’s a bit more to it than that. Basically, the sun hits the silicon wafers and sunlight is turned into electricity. That electricity is then sent through the wiring in the panel to the battery, via a regulator. Solar panels can deliver more power (voltage) than your batteries can accept, so a solar regulator needs to be used between the two to moderate the panel’s input. WHAT TYPES OF SOLAR PANELS ARE OUT THERE? A solar panel (or photovoltaic module) is a series of individual solar cells connected together to make up a large panel. Each cell is typically made from silicon, which turns UV light into electricity. They usually have a toughened glass protecting the solar cells and are typically impact resistant. There are three main types of solar panel on the market applicable to caravans and RVs: polycrystalline; monocrystalline; and amorphous. Monocrystalline panels are made from single crystal silicon, while polycrystalline panels have multi-layered crystal wafers that allow the panel to be smaller. Both these types of panels are rigid, solid and quite heavy. Monocrystalline panels are slightly more efficient but polycrystalline can operate in higher temperatures. The third type of panel is called amorphous and the main difference is its flexibility. It folds away like a blanket and can be draped over a caravan or an awning. Amorphous panels are much lighter per watt than the other types but have a higher cost per watt. They also tend to be a bit less robust and can be susceptible for damage. However, they are perfect to roll up and carry in a backpack or car, to recharge a sat phone or camera. You’ll find fixed solar panels are a no-fuss option with next to no setup required. They can also help insulate your caravan or camper from the sun’s heat. The downside is that they can be a bit heavy for some pop-top models, and they rely on being parked in the sun to be efficient. The benefit of a portable solar panel is you can park in the shade and set the panels up a few metres away in full sunlight for maximum efficiency. The drawback being you’ve got to set it up manually and there’s always the risk of theft. In short, portable panels are usually more efficient as they’re able to be tweaked into the perfect position, but fixed panels usually make up for this by including more solar power into the system. DOES MY SOLAR PANEL NEED FULL SUN? For optimum performance, your solar panel must be pointed at the sun. Aiming it at blue sky and away from the sun will not work. And, generally speaking, it should be aligned at right angles to a direct line to the sun, otherwise its efficiency will drop away. Having the panel angled at, say, 30 degrees to the sun’s rays will drop panel output significantly. Cloud cover will reduce panel output by as much as 90 per cent or more. Even on bright, sunny days, peak solar energy is available for only limited hours, as earlier or later in the day, the oblique angle of the sun’s rays passing through the atmosphere diminishes energy. This varies according to the season and latitude. Temperature will also make a difference. Solar panels operate most efficiently at a surface temperature of 25 degrees. The other thing to consider is that, even if you get sunlight every day, the quality of that light and how much power it can send back to your battery via a panel, varies throughout Australia. Atmospheric pollution in cities, dust in the outback, cloud cover, shade from trees and the time of the year are all factors. 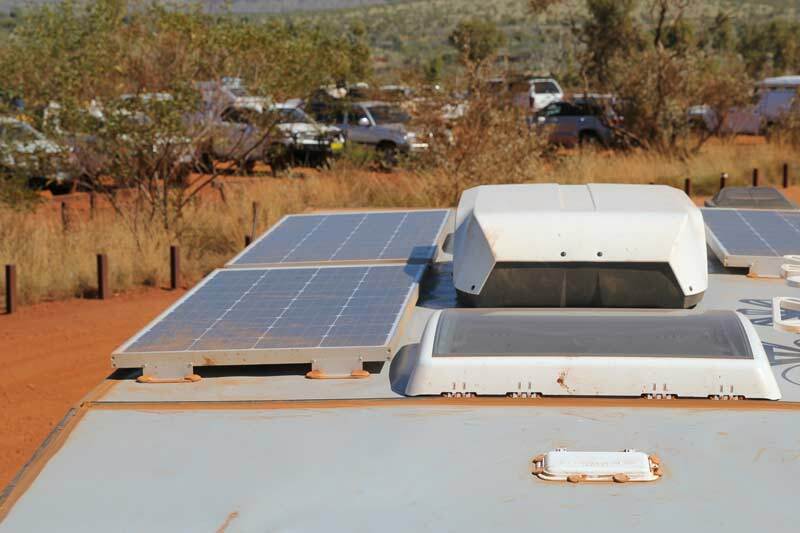 To keep an eye on the performance of your solar panels, use a battery monitor, such as Trek or Drifter, connected to your caravan power management system. HOW DO I CLEAN MY SOLAR PANEL? Most permanent solar panels sit nearly flat on the roof, which means dirt and dust that has been collecting on the surface of the solar panel has nowhere to go. Cleaning the solar panel periodically will ensure the solar cells are achieving maximum exposure to the sun, thus maximising their overall efficiency. If you tend to use a polishing motion to clean your solar panel, there’s a good chance you’re actually creating a static charge, which attracts dust particles. The best way to keep your solar panel clean is to wipe it over with a water/detergent mix, before rinsing it with clean water (with a small amount of detergent) and letting it dry on its own. The detergent actually acts as an anti-static agent.